As late summer's tomatoes begin to disappear and the markets fill with unsightly root crops I start to crave the warming, more sustaining foods of fall. While I would gladly eat a giant green salad any day of the week, sometimes I just need a meal with a little more oomph, especially after a long day in the cool, fall air. The basic premise here is pretty familiar albeit not very glamorous: the loaded baked potato. 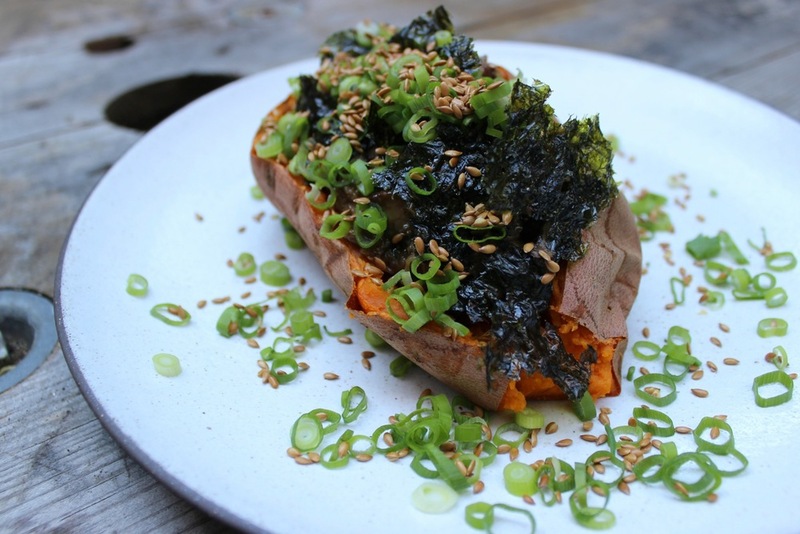 Forgoing the starchy white potato and mound of sour cream, I opted to fancy things up with a slow-roasted sweet potato and a wild pile of roasted seaweed, flax seeds, and green onion. The Best Roasted Sweet Potato: Find yourself some nice sweet potatoes. For this type of recipe long, slender potatoes work well. Many farmers markets in the area will carry sweet potatoes all winter long and some growers will even have them in surprising and delightful colors (purple! white!). The different varieties can vary in sweetness and starchiness but, in general, the traditional brown with dark orange flesh will yield the sweetest, smoothest interior. Give yourself plenty of time - at least 90 minutes until you'd like to eat - and preheat the oven to 400°F. Scrub the potatoes thoroughly while the oven preheats and place them on a rimmed baking sheet or roasting pan. Once they're in the oven, hang tight for at least an hour. Maybe try a yoga class or a few loads of laundry. It takes time for the magic to happen but it is very much worth the wait. The sweet potatoes are done when they are completely tender to the touch and have started oozing their natural sweetness in little caramel-like drops, usually at either end of the potato. From here, you have all kinds of options. They keep and reheat well so you can make a handful and have them on hand for a quick meal or snack. You can also scoop the flesh out from the skin and make a delicious mash or soup base. Once they're in the refrigerator I've also used them as an amazingly smooth, sweet base for fall smoothies. 1. Put a small spoonful of coconut oil and sprinkle of cinnamon inside and then fluff up the flesh with a fork; top with chopped pecans, a dollop of thick yogurt, and a drizzle of honey. 2. Go savory with a spicy scramble of eggs, peppers, onions, and whatever chiles or hot sauces your pantry provides. A little bacon or sausage would not be unwelcome here, if that's your jam. 1. Use up leftovers! Roasted vegetables, chili, curry, etc. would all be delightful and can be stretched a lot further when nestled into a sweet potato. The photo above included a savory mixture of roasted eggplant and mushrooms that I tossed with some thinned miso for a very tasty filling. 2. Get creative with toppings! Fresh herbs and vegetables (slaws, sprouts, green onion, herbs, etc.) and crunchy things (toasted nuts and seeds, seaweed) are especially nice. 3. Sauce it up! Tamari, vinaigrette, barbecue sauce, you name it - whatever is pourable and makes you happy. 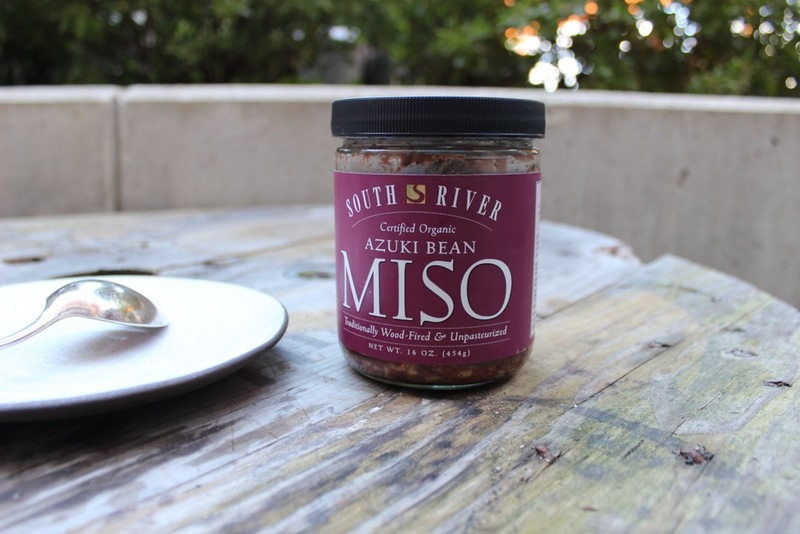 Lately I've been crushing pretty hard on South River Miso which I thin with a bit of warm water and pour over/toss into just about anything. Seriously, if you're into fermentables and small scale craftsmanship check out South River Miso based out of Conway, Massachusetts. Their story is amazing and the products are as delicious as they are healthful. We bought our first tub at Mom's Organic Market while looking for a miso that didn't have a laundry list of weird additives. Most of their products are wheat free (check the labels) and their fermentation is traditional with minimal processing. Miso makes quick soups a breeze (as simple as stirring some miso into boiling water) and can lend a nice depth of flavor to very simply prepared vegetables and grains. Bottom line: go play outside in the fall air while it lasts, load up your perfectly roasted sweets with delicious and nutritious fillings, and get your miso groove on.